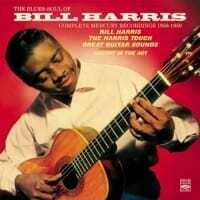 On his second album for the label, “The Harris Touch,” Bill was backed by a conventional rhythm section and a bongo player. The session featured the excellent piano work of Hank Jones, with three of the tunes vehicles to showcase of Harris’s electric guitar. On the Mercury/Wing album, Harris again performs solo, displaying his remarkable feeling for the unamplified guitar in both jazz and semi-classical contexts. The fourth album on this set is also a solo recital, recorded during a Bill Harris concert in Washington in 1962. Harris plays with engaging easiness in a live program which mainly includes material from the other three albums, demonstrating his abilities as an improviser of lovely, rhythmically resilient variations. Down Beat magazine defined his style as a combination of beauty, lyricism, charm and solid strength. This collection of performances is both a masterpiece of guitar versatility and a master class in improvisation. "A guitarist who spent at least two decades on the road with rhythm & blues vocal group the Clovers, Bill "Willie" Harris had a thick background in bebop and swing guitar as well as gospel. The latter style was at his fingertips even before he discovered guitarists such as Oscar Moore on records and radio, since Harris' father was a preacher who was in the position to turn the church organist job over to his offspring. Meanwhile, Harris' mother was drumming in basic harmony and an uncle had chipped in with a guitar, apparently to be the beauty move. The Army supplied a bugle that temporarily halted progress with strings attached, so to speak. Harris was discharged in the mid-'40s and promptly began studying guitar in Washington, D.C., becoming fairly good with both jazz and classical pieces. Harris was encouraged particularly in the classics by high-up staff at the Columbia School of Music, yet seems to have picked the Clovers due to a perceived scent of economic security. The choice, interestingly enough, still wound up leading to expanded musical horizons when fellow rhythm & blues and session guitarist Mickey Baker eavesdropped on a Harris dressing-room practice session and began pulling strings for what would be a series of releases under Harris' own name, such as the 1960 Great Guitar Sounds. The previous EmArcy Solo Guitar from 1956 is considered to be the first album of solo jazz guitar ever released. During the '70s, Harris operated Pigfoot, a Washington, D.C., restaurant, nightclub, and art gallery."